Lara Marlowe was Middle East Correspondent for the Irish Times 1996–2009. She was US Correspondent 2009-12. She is now the Paris Correspondent. She defined their hostility to Israel during the Intifada years. She defined their super-partisan coverage of Obama, spinning for Obama even harder than he spins for himself. She has spent her whole career writing biased attacks on America and Israel. (No wonder she likes Obama!) If anyone doubts that the Irish Times is a partisan left-wing paper, just look at Lara Marlowe. Lara Marlowe was married from 1994 to 2006 to one of the world's leading anti-Americans, Robert Fisk. Robert Fisk is so anti-American he was praised by Osama Bin Laden in 2004: "This is the message which I sought to communicate to you in word and deed, repeatedly, for years before September 11th. ... And you can read it in my interview with Abdul Bari Atwan, as well as my interviews with Robert Fisk. The latter is one of your compatriots and co-religionists and I consider him to be neutral. So are the pretenders of freedom at the White House and the channels controlled by them able to run an interview with him? So that he may relay to the American people what he has understood from us to be the reasons for our fight against you?" So during the Intifada era and the Bush era, the Middle East correspondent for The Irish Times was the wife of a man so anti-Israel and anti-American he was praised by Bin Laden. Lara Marlowe section. They rate her as the most biased writer against Israel at the paper, even worse than Michael Jansen! Inside the world's biggest prison, Lara Marlowe on Gaza, January 24, 2009. She absurdly claims that the "siege" of Gaza is the cause of the rocket fire: "The world turned a blind eye as Gazans languished in the world's biggest prison, unable to travel, import, export or interact with anyone or anything beyond their borders. And the world largely ignored the rockets Hamas fired in anger and frustration from within the siege." Ridiculous. If the siege caused the rockets, then what caused the siege in the first place? Has she even thought about this for 5 minutes? And Hamas don't kill Jews because they are "angry" and "frustrated". They kill Jews because that is their nature. Lara Marlowe, Irish Times, January 28, 2012, interviews the anti-Israel dhimmi academic John Esposito. We don't expect balance here, and we don't get it. No alternative to Esposito's absurd views is presented. But there are some revealing statements. For example: "Esposito was “a strong supporter” of Obama and will vote for him again." Esposito also says he is more worried about Israel than Iran: "I’m uncomfortable with Ahmadinejad’s rhetoric. But the person I’m more concerned about is Netanyahu". Of course! "Irish Times Turns Hamas Into Innocent Victims of Israeli Aggression". Honest Reporting, December 28, 2014, replies to some hideous, distorted, one-sided anti-Israel propaganda from Lara Marlowe. 'Nothing has changed. 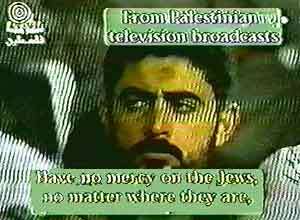 The army didn't finish the job', January 30, 2009, piece by Lara Marlowe, describes Israelis watching a video of an Oct 2000 sermon at a Gaza mosque by Ahmad Abu Halabiya, former Rector of the Islamic University of Gaza. Ahmad Abu Halabiya said in the sermon (broadcast live on PA TV): "O brother believers, the criminals, the terrorists are the Jews, who have butchered our children, orphaned them, widowed our women and desecrated our holy places and sacred sites. They are the terrorists. They are the ones who must be butchered and killed, as Allah the Almighty said". A lot of butchering of Jews followed. First, Marlowe insultingly compares the Israeli video of this to jihadi propaganda videos. As if reporting on the actual words of jihadists is hate speech! Then she expresses a strange doubt as to its accuracy: "Intercut with the rubble and gore is a blurry grey image of what is allegedly the interior of a mosque in Gaza. "They must be butchered and they must be killed," says the caption, attributed to Hamas". Why was she too lazy to do the 5 minutes Googling that led me to the transcript and speaker? Finally she incredibly says: "Hamas is utterly, totally demonised in the eyes of Israelis." As if there's something wrong with "demonising" primitive Jew-killing terrorists like Hamas! How narrow-minded the Israelis are to "demonise" genocidal totalitarians. Lara Marlowe can even read about Ahmad Abu Halabiya at the ADL site. The New York Times doesn't like Googling either. 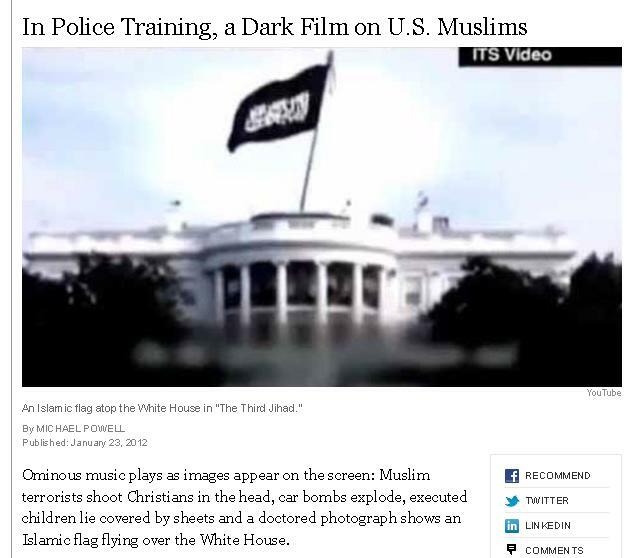 This article of 23 Jan 2012 is shocked at an "Islamophobic" film showing the black flag of Islamic jihad flying over the White House. They don't bother doing the one minute's Googling that would show them that this image was made by the Islamists themselves. US just doesn't get it about motivation for suicide attacks, Lara Marlowe, 13 Jan 2010, shows Marlowe's inability to understand the jihad. The article is tired old left-wing claptrap that the US and Israel are the cause of the Islamic terror (jihad) and Islamic oppression (sharia) that has been going on across the world for nearly 1,400 years. Here's how she deals with the bizarre left-wing and Islamic anger that blames the allies for killings done by jihadis: "hundreds of thousands of Iraqis are believed to have been killed and thousands of Afghans. US officials say most die at the hands of their own countrymen. That doesn't change the perception that the US is ultimately responsible because it started both wars." Note she doesn't say that this "perception" is insane, and shows that the root cause of Islamic anger and violence must lie elsewhere. She writes as if this "perception" has a point to it. She says if you'd been in Guantánamo, "you'd probably join an extremist group too". Speak for yourself, Ms Marlowe. Most people who suffer do not become sadistic killers. And jihadis don't join up because they have "suffered". (Most haven't.) They join up because they are in the grip of religious euphoria and fanaticism. They are starry-eyed believers, not normal decent people driven to desperation. She talks of "the .. dangerous failure to provide Muslims appalled by US policies with an alternative to suicide bombing." Um, duh. How about voting? Jihadis don't suicide bomb lines of voters because they have "no alternative". They do it because that's the kind of people they are. She bizarrely claims that "the creation of a viable, independent state for the Palestinians" would reduce, rather than escalate, Islamic terror. No evidence for this is provided. If lefties want the US to "get it", they should come up with some evidence, rather than just making arrogant assertions. John McGuirk also fisks the article. Iraqi couple creating new life in land which destroyed their own, Lara Marlowe, February 20, 2010, about some Iraqi refugees in the US. What a disgusting headline. The jihad, not the US, destroyed Iraq. But hell will freeze over before Marlowe will recognise this. She writes: "Amjed and Aseel recognise the paradox: the US wrecked their country, and now welcomes them with open arms, and they are grateful." The jihad could not possibly be to blame. Only the white man can be guilty! US midterm poll a tough referendum on Obama, Irish Times, November 1, 2010. Lara Marlowe furiously spins for Obama before his mid-term disaster. Her analysis is as follows: "He looks set to lose because of three things: the 9.6 per cent unemployment rate, which shows no sign of abating; disinformation by Republicans, and Obama's own ineptitude as a communicator." That is, he will lose not because Americans reject his left-wing policies, but rather because of "disinformation" and poor communication of his greatness. I don't recall Lara Marlowe spinning for Bush like this. If you remember the articles where she did, please tell me here. I missed Lara Marlowe's furious spin for Obama before the election, 27 Oct 2010. She claims (based on no evidence other than some long forgotten speech) that Obama wanted to be bipartisan: "Bipartisan co-operation was a hallmark of Obama's political philosophy." But apparently her hero was foiled by the wicked Republicans, who, despite having control of neither house, somehow managed to block the President: "Partisan gridlock has blighted Obamas first two years in office ... After nearly two years of Republican obstructionism in Congress, and in the last throes of a particularly vicious midterm election campaign, Obama's appeal for bipartisanship sounds naive now." What sounds naive is all those floating centrist voters in 2008 who thought that the arrogant, patronising, ultra-partisan left-winger Obama would be somehow centrist and bipartisan like Bill Clinton. Here is how she spins the fact that the worst Islamist terror homeland attack in 7 years happened months into Obama's watch: "With the exception of Maj Hasan's rampage, US territory has been spared further lethal extremist violence under Obama's watch." In fact, even apart from Fort Hood, the list of Islamic attacks on the US shows an uptick since Obama arrived. A weak leader seems to invite adventurism. 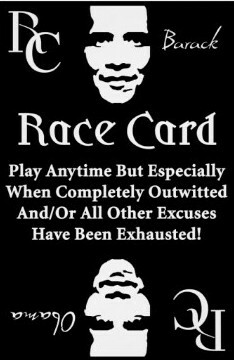 And finally, the race card. If you don't like this weak leftie President, you are a racist. "There's an echo of racism in the Tea Partiers' determination to "take our country back" from the black president". I guess Allen West is a racist then! Just to clarify, Lara Marlowe, this uncritical Obama booster, is the chief US correspondent for The Irish Times. Snub of historic proportions to elected leader of free world, a Lara Marlowe classic, 20 Nov 2010. This non-story is about the new Republican leaders being "too busy" to talk to President Obama, who - having ignored the Republicans for 2 years - suddenly wants to meet them now they control the House. Lara Marlowe is outraged by the snub to her hero Obama: "This shabby treatment of the democratically elected leader of the free world". Was she ever outraged by any snub to Bush, ever? Has she ever written anything that shows she even believes in the concept of "the free world"? Double vision over US status: right and left talk it up and down, Lara Marlowe, 3 Dec 2011. "In Republican debates, [Mitt] Romney accuses President Barack Obama of "apologising" for America. It is a roundabout way of saying the first African American president is different, not one of us." Marlowe yet again says that anyone who criticises the President is racist! How long can she play this race card? Forever, it seems. It seems that people like her won't be happy until Republicans all support a Democrat President, and give up any idea of proposing their own candidates. How dare the opposition actually oppose the President and propose alternatives! If you criticise Obama's "apology tour" you are a racist, according to Lara Marlowe. The Heritage Foundation gives us a rundown of Obama's apologies for America. Maybe Lara Marlowe should read this. Lara Marlowe loves to play the race card. Again and again, she implies that criticising Obama is "racist". Lara Marlowe's spin for Obama before the mid-term election, 27 Oct 2010. "There's an echo of racism in the Tea Partiers' determination to "take our country back" from the black president". TIME magazine's Joe Klein is a kindred spirit of Marlowe. Joe Klein, September 16, 2009, says that the Tea Party, Sarah Palin - indeed any critics of Obama - all are racist. "My sense of the teabaggers is ... they are primarily working-class, largely rural and elderly white people. They are freaked by the economy. They are also freaked by the government spending - TARP, the stimulus package etc. - that was necessary to avoid a financial collapse." [Furious spin for Obama.] "But most of all, they are freaked by an amorphous feeling that the America they imagined they were living in - Sarah Palin's fantasy America - is a different place now, changing for the worse, overrun by furriners of all sorts: Latinos, South Asians, East Asians, homosexuals…to say nothing of liberated, uppity blacks. In that sense, Barack Obama is the apotheosis of all they fear." How pathetic. It's just sliming people without any evidence. Klein goes on to say, by contrast, how wonderful he is: "Finally, I should say that the things that scare the teabaggers - the renewed sense of public purpose and government activism, the burgeoning racial diversity, urbanity and cosmopolitanism - are among the things I find most precious and exhilarating about this country." Mark Steyn in After America (2011) hilariously points out that Klein chooses to live in Pelham, New York, which is 87.33 percent white. While Sarah Palin lives in Wasilla, Alaska, which is 85.46 percent white. "Unlike Wasilla ... Pelham is within reach of splendidly diverse, urbane, and cosmopolitan quartiers - the Bronx, for example - yet Joe Klein, Mister Diversity, chooses not to reside in any of them, and prefers to live uppitystate of the uppity blacks. Statistically speaking, he lives in a less diverse neighborhood overrun by fewer "furriners" than that chillbilly bonehead's inbred redoubt on the edge of the Arctic Circle. Yet she and her supporters are the "racists and nativists," while Joe preens himself on his entirely theoretical commitment to "diversity."" Democrats are not less racist than Republicans, according to the stats. There is little difference. Lara Marlowe calls the Tea Party "racist" for wanting to get rid of Obama. 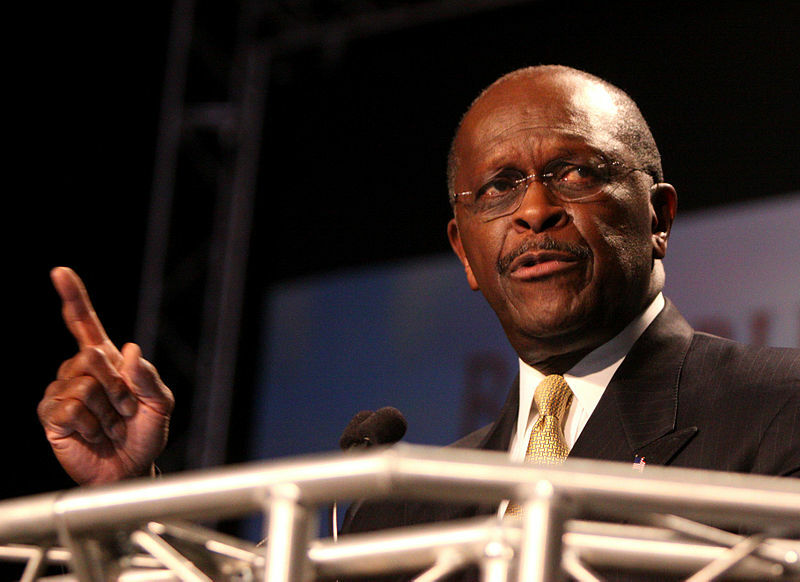 Yes, that's why they like Herman Cain (above). Not to mention Allen West. And Tim Scott. And so on. What a pathetic argument. "You must be racist if you oppose a black left-winger!" Marlowe plays it even more than Obama does! 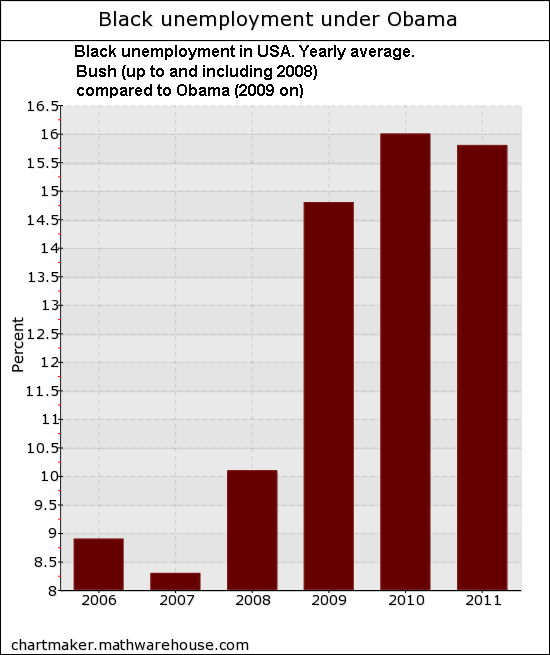 Black unemployment under Obama, as compared to the "racist" Bush. Don't expect Lara Marlowe to cover this story! Lara Marlowe calls any opposition to the great President Obama racist. She called the Tea Party racist, despite no evidence. So it is pretty amusing, given her hatred for the boring, family-oriented, moderate, mainstream Tea Party, to see her gushing support for the radical, aggressive, hate-filled, violent, vandalising, criminal "Flea Party" (the Occupy movement). Poll, Oct 2011, shows the Tea Party is more ethnically diverse than the Flea Party. USA is 11 percent black. Tea Party is 6 percent black. Occupy Wall Street is 1.6 percent black. But Lara Marlowe isn't listening. Here, she gushes about the Occupy movement in the Irish Times, 19 Nov 2011, and compares it to noble protests of the past. The Occupy Wall Street protests compared to the Tea Party protests that Lara Marlowe hates. Graphic from The Jawa Report. Lists of "Occupy Wall Street" crimes, deaths, violence and incidents here and here. There is a reason why they were called the "Flea Party" or "Flea Bag" protests. Hilarious. A calm, logical Brit (Charles C. W. Cooke of National Review) interviews an Occupy person, 11 Oct 2011. He asks him why the state should pay for his college tuition. "I mean I'd quite like a new car. Should that be paid for?" 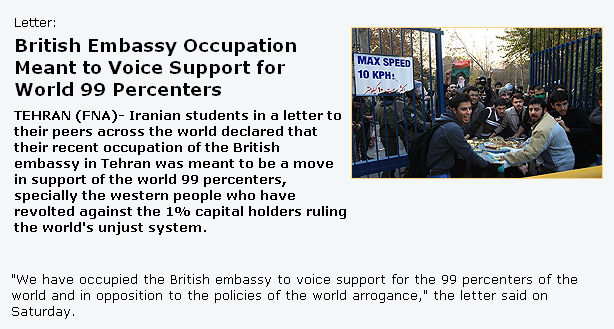 The Jew-hating tyranny of Iran, the world's no.1 terrorist state, declares its solidarity with the Occupy movement. Makes sense. From Iranian state controlled propaganda, 3 Dec 2011. After the Iranian state controlled attack on the British Embassy on 29 November 2011. Iranian regime leader Ayatollah Khamenei praises the Occupy movement, Aug 2012. Oddly, I can't find Iran praising the Tea Party. 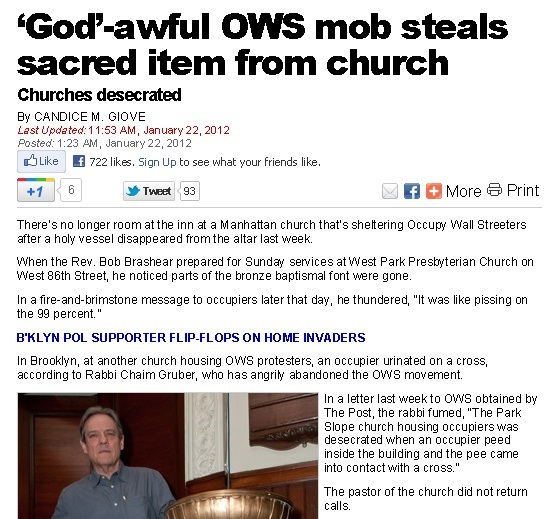 And of course no piece on the Occupy movement would be complete without a statement from this idiot. 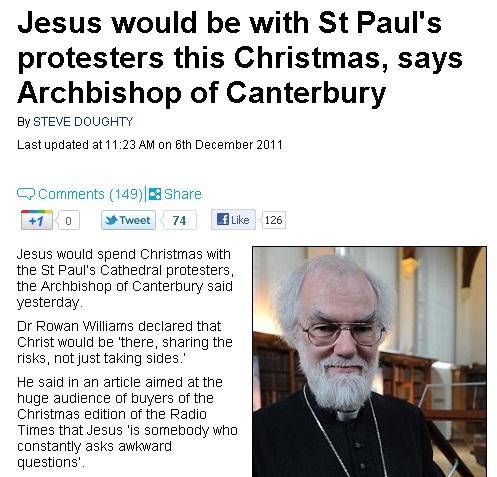 Many leftie clerics like Rowan Williams have been supporting the Occupy movement, and letting them block and use (desecrate) their churches. Of course the Occupy people appreciate this: "parts of the bronze baptismal font were gone ... an occupier peed inside the building ... an occupier urinated on a cross ... a $2,400 Apple MacBook vanished from [the cleric's] office." They're just like the Tea Party! 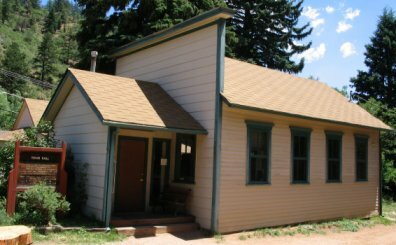 The 19th century town hall of Green Mountain Falls, Colorado. Built in 1890. Burnt in Feb 2012 in an arson attack by "Occupy" protesters. Trailer for Occupy Unmasked (2012). The following double standards are absolutely hilarious. 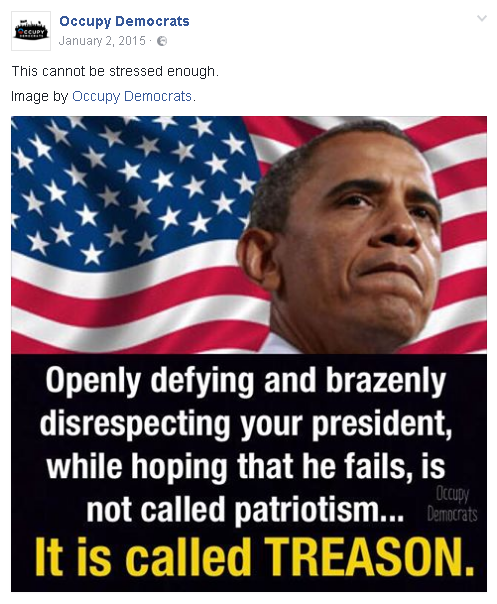 Jan 2015: "Occupy Democrats" says that "disrespecting" President Obama is "treason". 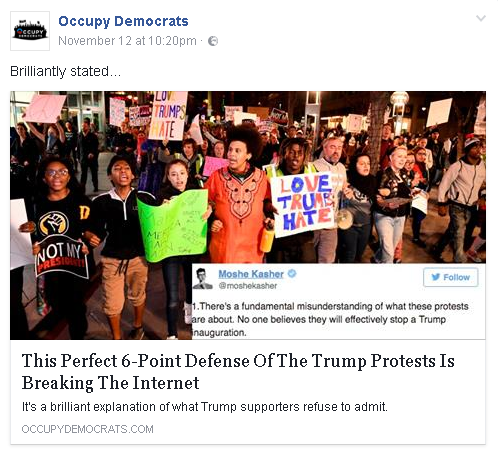 Nov 2016: "Occupy Democrats" supports the protests against the election of President Trump. In the 2012 US presidential election, Lara Marlowe does everything she can to spin for Obama. Why would anyone who is not a Democrat supporter read the Irish Times? Republican Party too 'wacko' to still be considered mainstream. Another party political broadcast on behalf of the Democrats by Lara Marlowe, Irish Times, 26 May 2012. Lara Marlowe's article of Democrat talking points comes just days after a poll showing 46 percent of voters backing the Republican candidate for President, Mitt Romney, and only 43 percent backing the Democrat candidate, Lara Marlowe's hero Barack Obama. It takes some arrogance to declare that the majority of voters cannot be considered "mainstream". Tim Johnston, 27 May 2012: "blah blah blah same old same old. Can't win an argument so the liberals have to claim their opponents are nutty. Been happening since at least the 1930s. ... When someone is writing articles calling the biggest political party in the United States "extremist" it begs the question of who is the real extremist?" Obama-supporter James Fallows, Mar 2012, gives an example of this, writing that Obama has "the prospect of occupying the acceptable center, as the Tea Party spins the Republican Party off to the extreme." Andrew Ferguson, 10 Sept 2012, has a funny line in reply: "Like so many commentators, Fallows has seen the Republican party spinning off to the extreme since the Nixon administration." Lara Marlowe on the Republican candidate Mitt Romney, 20 June 2012, doesn't even pretend to be impartial: "More audaciously, Romney, the millionaire founder of Bain Capital, which fired employees by the thousands, now portrays himself as the defender of the downtrodden. In his speeches, Obama analyses and explains. Romney delivers unfounded assertions in easily digested sound bites." Romney adviser reverses after playing race card, Lara Marlowe, 27 Oct 2012. At last, after all these years, Lara Marlowe, the biggest player of the race card in all Irish discussion of US politics, finally notices the race card! She attacks the Romney camp for using it! Thoughts of Gettysburg address and Lincoln as Obama took stage, Lara Marlowe, 8 Nov 2012. "President Barack Obama’s victory speech early yesterday was in a league with the orations that propelled him to the Oval Office in the first place ... Historians may one day put it on a par with Abraham Lincoln’s Gettysburg address." Lara Marlowe has spent years implying that opponents of Barack Obama are "racist". So it is hilarious to find an example where she supports the white politician, and wants to see the black politician defeated. A writer I know called Lara Marlowe would call this kind of thing racist! In 2010, Florida's 22nd congressional district, which is 82 percent white, 11 percent Hispanic and only 4 percent black, nevertheless elected a black representative Allen West. 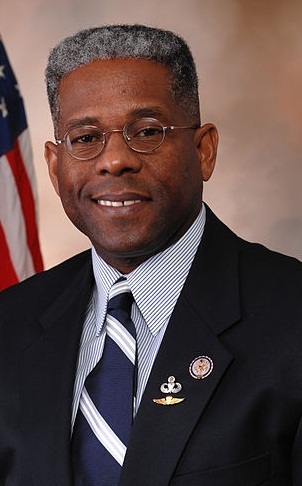 For re-election in 2012, Allen West switched to Florida's 18th congressional district, which is 63 percent Hispanic, 30 percent white and 6 percent black. Allen West's 2010 election in an 82 percent white district was a wonderful example of how non-racist the white American voter is. And yet Lara Marlowe wants him out in 2012, and she supports his white opponent. Hilarious stuff. 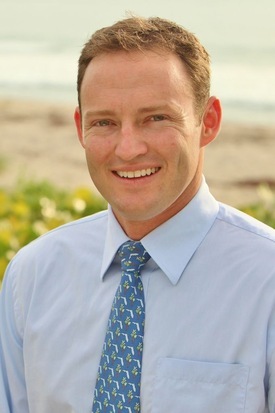 Right: His opponent Patrick Murphy (D). Which one does Lara Marlowe support? That's right, the white guy! For some reason, here it is alright for Lara Marlowe and the Irish Times to support the white man, and oppose the black man. Lara Marlowe's article is, incredibly, titled: Irish-American takes on Tea Party extremist, Irish Times, October 25, 2012. "Irish-American" for the white man is a nice touch. A writer I know called Lara Marlowe would say it has echoes of a tribal, racist appeal to the Irish newspaper reader. And "extremist" for the black man is also a great touch. A writer I know called Lara Marlowe would say this is painting him as the "other", not "one of us". Cracking ad from Allen West contrasting what he and his opponent were doing in 2003. Wait a minute, am I racist for liking this ad? "The funny part is that the only people conspicuously obsessed with Obama’s race are the people who trot out this nonsense. The logic sometimes seems to be, “we love that Obama is black, therefore people who don’t like Obama must not like him because he’s black.” Maybe we just don’t care and we’re focusing on other things? I have no doubt there are people who don’t like Obama because he’s black. But I’ve never personally met such a person". - Jonah Goldberg on Obama-lovers like Lara Marlowe who think his critics are "racist". Return to The Irish Times.